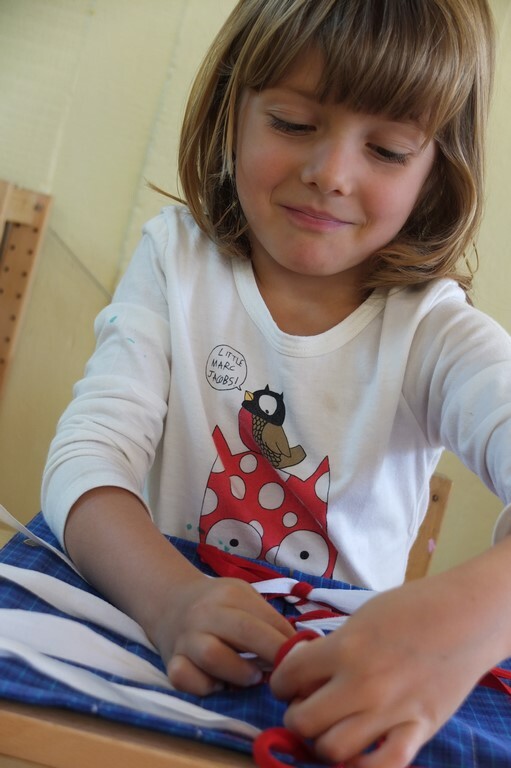 The richness of a Montessori classroom, prepared for the children and completely accessible to them, allows them to satisfy their curiosity: practical life, motor skills, sensorial development, language (French, English), mathematics, physics, geography, botany, zoology, music and art are all offered on an individual basis. 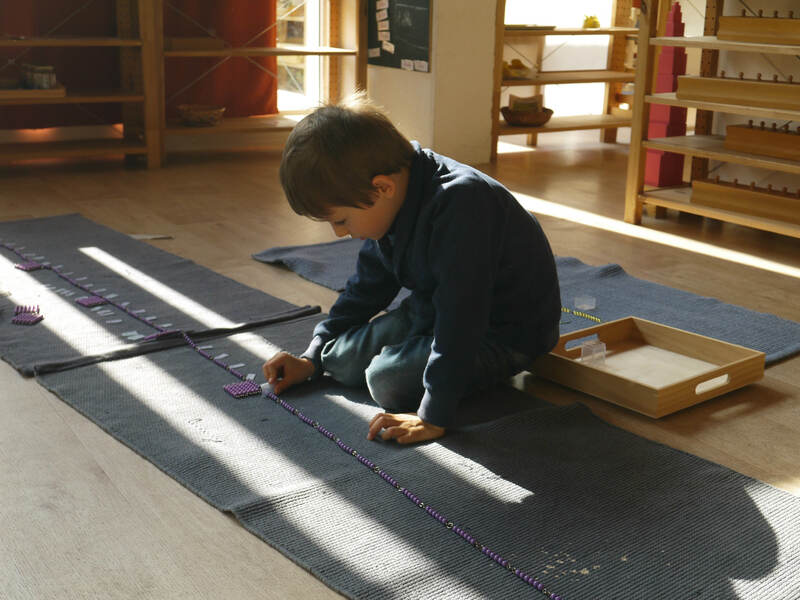 All of the Montessori material has been scientifically designed to be progressive in order to isolate difficulties and self-corrective in order to encourage the child’s autonomy. It is based on a method of learning that is concrete and sensorial, specifically designed for the young child. The work the children do with their hands allows them to develop their concentration, which will further their capacity to learn. The material helps them master their movements and develop their fine motor skills. For example, to prepare for writing, the child works with material that will help him reinforce his grip, work from left to right and build flexibility in his wrist so that, when he finally begins to write, the gesture is natural and easy. The material progressively builds the child’s senses and helps him to internalize his actions, while also developing his logic and capacity for abstract thought. He builds strong bases and really understands what he is learning. 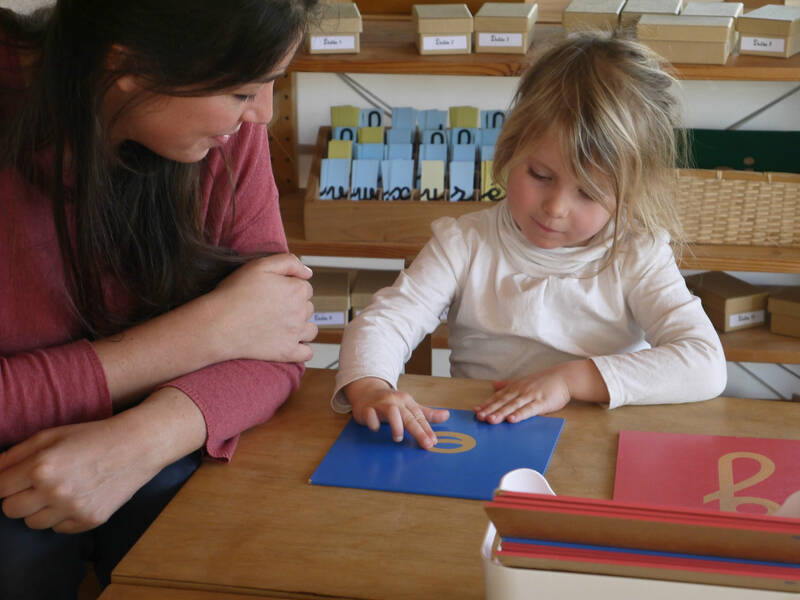 The attractive Montessori material is arranged in an orderly fashion as to be coherent with the child’s own sense of order, and there is only one example of each material in the classroom, as to teach the children patience. It allows the child to adapt to his environment with autonomy and to learn cultural codes (for example, politeness). This material will also give him the possibility to take care of himself. While carrying out daily tasks that refine his fine and gross motor skills, he learns to control his gestures and coordinate his movements. Certain practical life skills also prepare the child for writing. Time spent on practical life work also strengthens concentration, so important for any work as well as self-awareness. In this manner, the child is able to concentrate for longer periods of time, all the while learning through captivating experiences. Practical life material is always available to the children and they often turn to it because of the satisfaction they feel and the self-confidence it builds when they practice it. Examples: cleaning a mirror, dressing frames (for zipping, opening and closing buttons, tying shoelaces, etc. ), spooning and pouring activities for fine motor skills. 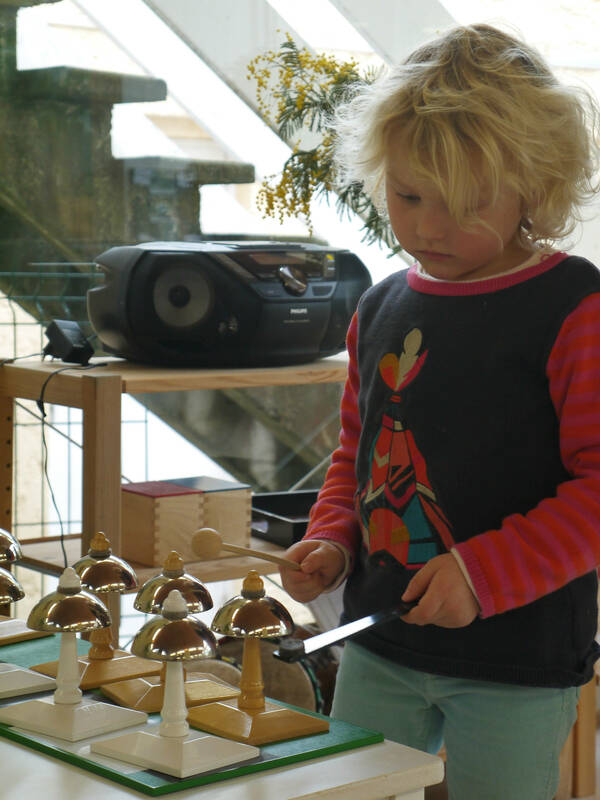 Children under six are sensory explorers, and the Montessori sensorial material is designed to construct their intelligence through the refinement of all their senses. It is designed to prepare for abstraction and to access a finer perception of the world. It also introduces detailed vocabulary to describe their environment with greater precision. This material allows children to distinguish, define, generalize and explore diverse qualities of their environment such as dimensions, colours, shapes, volumes, weights, flavours, odours and sounds. -writing: use of a "key" material- the sandpaper letters- to help the child memorize the trajectory of each letter, shape drawing to refine his grip and prepare for writing, etc. -grammar lessons learned via sensorial geometrical symbols which are colour coded as to visually display sentence structure. Examples: The sandpaper letter, mobile alphabet, phonograms. This concrete material is self-correcting and needs to be manipulated in order for the abstract notions of numbers, quantities, symbols and numerical operations to be better understood by the child. Examples: Sandpaper numbers and the first decimal system tray. The latter gives the child a sensorial representation of 1, 10, 100 and 1000 and a geometrical representation of the power of 10, indirectly preparing the child for mental arithmetic, plane and 3D geometry.